Thirty-six teams have entered the 20th Hawke's Bay Classic Doubles to be held at the Napier City Pétanque club this weekend (3-4 September). 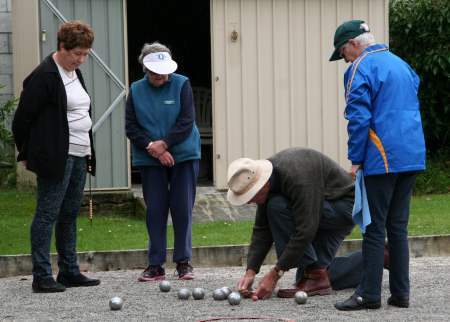 Thirty-six teams are taking part in the 20th Hawke’s Bay Classic Doubles at the Napier City Pétanque club. Seven teams were undefeated after Saturday’s five qualifying games. Brian Smith and Murray Porter. Murray Porter and Brian Smith turned up on Sunday expecting to be in the Bowl after only recording two wins in qualifying. However, they found out they had snuck into the top 16 on tie-break. From then, there was no stopping them as they battled through to the Trophy final. On the other side of the draw, Annick Le Guen and Claire Wilson made their second successive final. Unfortunately, for Annick and Claire they were unable to improve on last year’s result as Murray and Brian claimed the win. The agenda for next WPA Committee Meeting to be held at the Silverstream Pétanque clubrooms on Thursday, 15 September starting at 7:30 pm. Eight players have entered the Khandallah Open Singles this Saturday (10 September). The video of the 2016 Hawke’s Bay Classic Doubles final is now on the Wellington Pétanque YouTube channel. It is with great sadness that Masterton Pétanque Club announces the passing of MMW. MMW has been suffering from declining numbers in the last few years and the club has had to make the very difficult decision to cut all life-lines to MMW. It was decided at a special meeting of the Masterton Pétanque Club on 10/9/16 that all efforts to revive MMW were to no avail and has pulled the plug on the tournament. The club wishes to thank all those people over the 17 years who supported MMW. MMW is survived by its sibling the WBS Triples (WBS) and it is hoped that WBS will continue the proud traditions of Masterton Petanque Club Tournaments. Once again, thank you to all who supported MMW over the 17 years of its life. Results from the second day of the Inter-club competition. Masterton's third defence of the Jacques Cochonnet Challenge trophy was away to Upper Hutt. Down 2-4 after two rounds of games, Upper Hutt needed to win all three Round 3 games. However, they could only manager two, so Masterton retained the Trophy by 5 games to 4. Masterton's next match will be at home to Horowhenua. 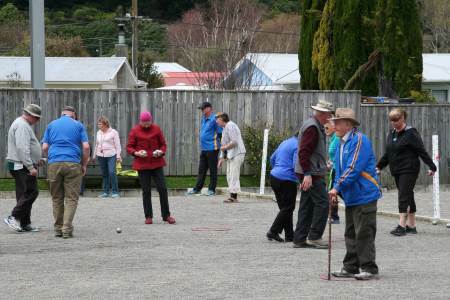 Thirty-six players have entered the WPA Regional Singles Championship to be held at the Horowhenua Pétanque club this weekend (17-18 September). 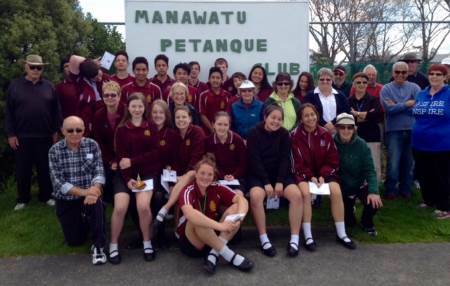 Thirty-seven players took part in the Regional Singles Championship at Horowhenua, an increase of one on last year. This year two players, Christine Strichen and Graeme Morris, went through undefeated after the five rounds of qualifying held on Saturday. However, both slipped up on Sunday morning to drop down into the Plate. In the Championship, Shirley MacDonald faced Claire Wilson in the first all-female final. After an even opening few ends, Shirley surged ahead to claim her first Regional Singles title to go with her two Senior Doubles titles. The video of the 2016 WPA Regional Singles Championship final is now on the Wellington Pétanque YouTube channel. 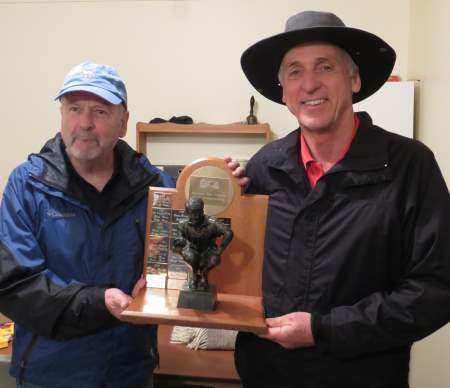 Masterton's fourth defence of the Jacques Cochonnet Challenge trophy was to be at home to Horowhenua. However, Horowhenua was unable to field a team and so have defaulted the match. Masterton's next challenge will be away to Hataitai. The Regional Seeding points have been updated using the results from the Regional Singles. Representatives from eight of the region’s eleven clubs took part in the Champion of Champions Singles tournament at Otaki on Saturday. Going into the last round Enoka Smiler (Park Avenue) was leading with 6 wins from 6 games with Annick Le Guen (Kapiti) one win back on 5. As luck would have it, they faced each other in the last round. Annick took the game 13-9 to win the title on tie-break from Enoka. Moises Burgos (Upper Hutt) claimed third place. This is Annick’s second title and the fifth won by Kapiti. Players in action at the Kapiti Memorial Mêlée. Amazingly, even though it was the first day of Daylight savings where there was a danger of people forgetting to roll their clocks forward, everyone arrived on time to register. Once again, the weather behaved, creating pleasant playing conditions for the 52 people from several clubs taking part. Prior to commencement of play, Brian Frampton, as Club Captain, welcomed the participants and went over the rules for the day. President Graham Hooper then asked for a time of silence as we paid tribute to those no longer with us. A total of 5 games were played, with 3 in the morning, a break for lunch, then the final 2 games after that. Energy levels were kept up by grazing on the excellent food provided by the locals. As usual, the volunteers helping in the kitchen kept everything shipshape. Thank you to all those who assisted. A big thank you to our illustrious president Graham and to Alan Taylor for the setting up of the scoreboards and the dismantling at the end of play. Report and photos Marlene Barker. 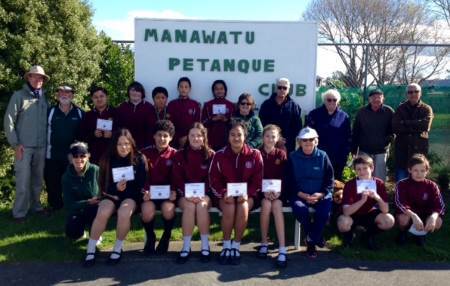 Manawatu Pétanque has just completed the last School Term coaching Queen Elizabeth College Year 9 and 10 Physical Education students under the guidance of their PE teacher Leanne Mark. Our Club Captain Elva, supplied a programme to begin with coaching the students on the basic skills of Pétanque. The students acquired these skills very quickly and by week 4 were able to apply and play games with very little supervision. Club Members supported the students during play with any queries they had and found scoring was the tricky part! We were grateful to be able to use the WPA junior boules as many of the female students had small hands. Thanks to Graeme Morris. On our last week club members played against the students and the scores were very close with the students displaying several had attained their own very skilful technique. All students received a certificate as well as the top Students who received a trophy or medal. We hope to continue to liaise with Queen Elizabeth College for further events such as this one. Report and photos Noeline Corley.